After some discussion in #opensuse-kde, darix has created the KDE:Apps namespace for KDE apps maintained by their upstream, so that they can serve fresh packages for all distributions supported by the Build Service (which includes openSUSE, SUSE Linux Enterprise, Fedora, RHEL, Debian and Ubuntu). As the first to join in, we warmly welcome the KMyMoney project! Got questions? Feel free to contact the openSUSE/KDE Team on the mailing list opensuse-kde@opensuse.org or in IRC: #opensuse-kde (irc.freenode.net). GTK3 will slowly replace the “old” gtk2, and of course, if we don’t want to be left behind we have to move to gtk3 eventually. Even if slowly (we need horse power! –> yes we need you too!!) LXDE is being ported too. Nothing has been released yet, but a good deal of work is actually into git repositories. Right now, only five packages don’t want to build with gtk3 and they are: gpicview, libfm, lxmusic, lxpanel, pcmanfm. Everything else builds fine. As a side note, lxdm gtk greeter build but seems to crasch. Please test those packages and report in our mailing list or even better upstream your issues. To conclude, right now i don’t feel comfortable to push into factory gtk3 packages, so 12.1 most probably will stuck with the well know stable gtk2 packages. The GNOME team plans to have GNOME 3.2 in for openSUSE 12.1 and thus have updated to the current development release 3.1.3. They have also started removing old GNOME 2 packages that are not needed anymore. Frederic gave an update on systemd integration. The graphical bootloader allows now to switch during boot between systemd, SysVinit and also shell code. Also, Lennart Poettering wrote in his “systemd for developers” series about socket activation where he uses cups as example. most of my time with rewriting the working copy code. at all and nothing should be broken. cleanup should be finished after this week. squidview is one of the software, I’ve always build and installed on each squid proxy server I build for me or customers. It’s small, stable, and usefull. So it was a clear real nice candidate to be use to improve my obs and packager skiil. I would like to thanks T1loc, yaloki, mrdocs, coolo, alin, and all others great packagers around, for helping and teaching me during the process. Squidview is an interactive console program which monitors and displays squid logs in a nice fashion, and may then go deeper with searching and reporting functions. To use squidview you must at least have read access to squid’s access.log file. You may need to see your administrator for this. 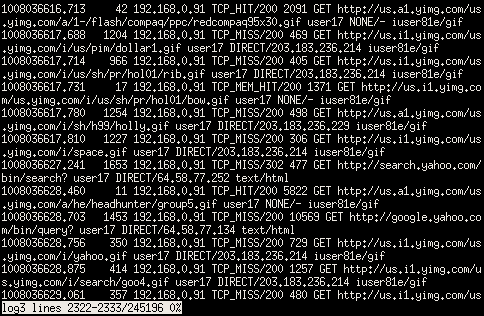 Squidview uses this text log file for all operations. It does not generate its own database for tasks. Squidview has a number of functions. Navigate the log file with the cursor pad keys, jump to a certain day or switch to a different log file. 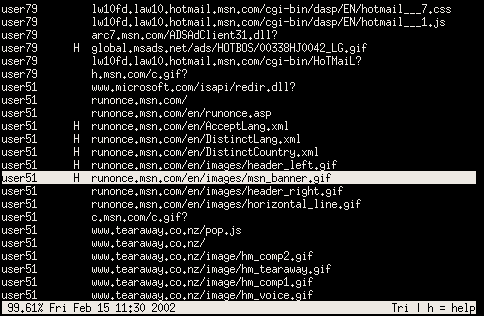 Search for text or large http/ftp requests. Put squidview into monitor mode: see the latest activity updated every 3 seconds (this is light on cpu load). Reports can be generated listing the heavist Internet users and the most popular visited sites. See how many cache hits squid makes to save network traffic. Squidview is released under the GPL. 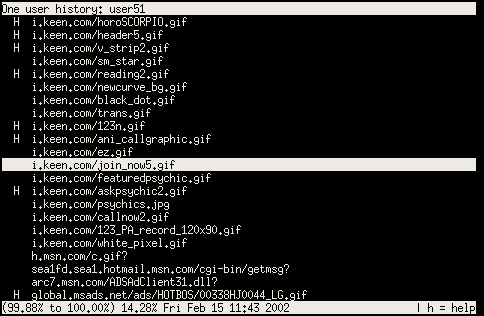 The selected line shows a request made for a .gif at the shown time. As luck would have it, the 'H' indicates a cache hit 🙂 In this mode user traffic can scroll by. What the above would be if viewed with less. A tally of all users against the bandwidth they used. Kept current in near real time. A quick investigation into the recent history of one user. zypper ar -c -f -n "server:proxy" http://download.opensuse.org/repositories/server:/proxy/openSUSE_Factory "server:proxy"
I created packages for the nice KDM and ksplash theme Steampunk. For this theme a matching color scheme, wallpaper and mouse theme exist and those are packed in the same rpm. Youtube shows the theme in action for Kubuntu, the version in the rpm is distribution neutral. The rpm can be obtained from the home:rbos repository, I hope you enjoy the theme. Run the following as normal user in terminal to get the required resolution. Note: just in case wordpress eats up – character, there are 2 – before output, panning and mode.